Bard overlooking the Elven army before the Battle of the Five Armies. Throughout their existence, Elves have been masters of making and using weapons and arms. Their skill at forging weapons and armour surpasses the race of Man, but of the race of Dwarves, Tolkien writes: "In the tempering of steel alone of all crafts the Dwarves were never outmatched even by the Noldor, and in the making of mail their work had no rival." Even more renowned is the Elven skill at using their fine weapons, be it bow or blade. The purpose of this article is to explain the type of weapons the Elves have used and what effect these weapons have had in past wars and battles. The article is not extensive, and covers only the most basic of Elven weapons. The Elven sword is used frequently by standard Elven warriors and it comes in different forms. Apart from notable Elven blades such as Anglachel (wielded by Beleg Cúthalion and Turin Turambar, as well as being forged by Eol, the Dark Elf), Glamdring (wielded by Gandalf), and Orcrist (used by Thorin Oakenshield), many more fierce swords have served their handlers well in battle and have no title. Descriptions of these swords and their representations in film and documentary range widely. In Tolkien's actual mythology, the reader can find no elaborate description of Elven blades, save those that have been given a title. A clue to what the earliest of the Elven blades were made of lies in a description of the first Orcs who attacked the Elves in Beleriand. Apparently, these Orcs were equipped with steel weapons which (if the reader will pardon the pun) gave them the edge over their Elven counterparts. Therefore, Elven weapons at that time were not in existence or were made of a weaker material than steel, presumably iron. The iron sword therefore could have taken on many forms. Elven iron or non-steel swords were most likely used in Valinor by the Noldor and other High Elves, rather than in Beleriand, and these blades were of course finely crafted. As one would suspect, any Elven blade is well crafted and of the highest quality, but when the use of steel weaponry came upon the Elves in Valinor, most notably the Noldor, a great change in the style of swordmaking and the sword itself came about. For one, the Elves developed different ways of making these blades, using the vital component of steel in the swords. 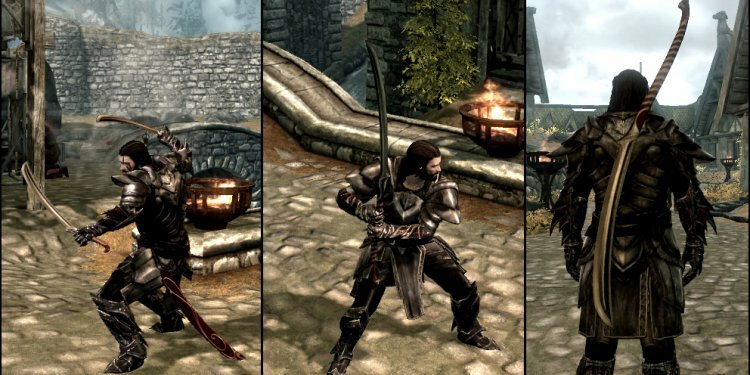 The shape of the sword changed, now being able to take on the form of a great broadsword or a light and agile curved sword. The Elves, being great artists as well as craftsmen, were able to decorate their swords more skillfully. Thus, they were able to win more battles as steel became common among Elves all over Arda, but better blades were to come. Sting, the shortsword used by the Hobbits Bilbo and Frodo, is an example of Elven blades at their peak. Being able to glow blue when orcs and goblins are near, Sting shows how Elven blades grew to have magical properties. Even the black sword Anglachel is said to have spoken to Turin before it aided him in his suicide. Thus, Elven blades became renowned as great weapons, capable of performing deeds beyond the skill of their handlers and were even more glorious when the use of Mithril was allowed to the Elves.